Pastafarian Lindsay Miller&apos;s driver&apos;s license. 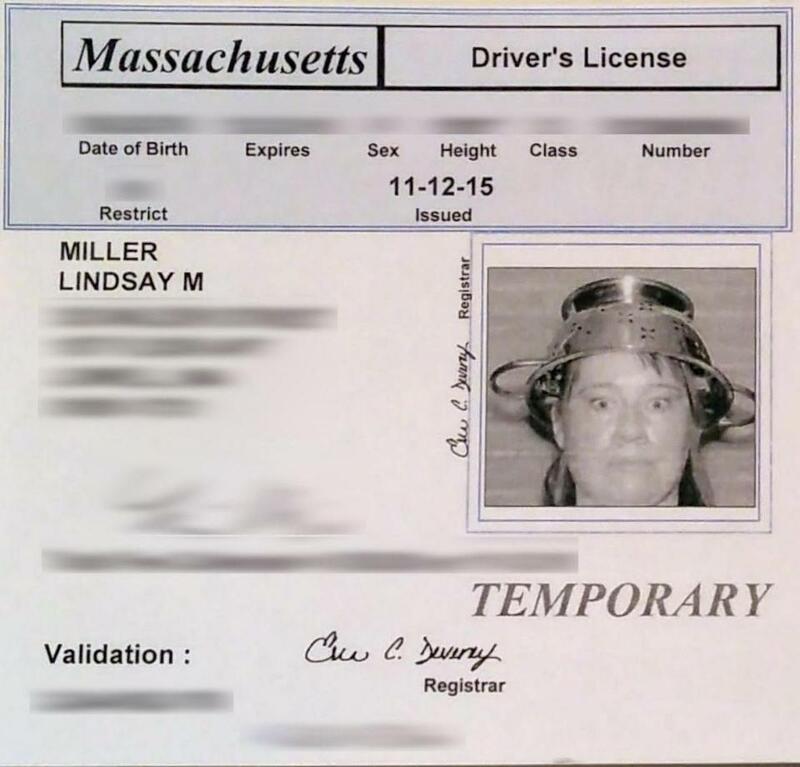 A woman who identifies herself as a Pastafarian, a follower of a religion that teaches that an airborne “spaghetti monster” could have created the universe, has succeeded in her bid to wear a colander on her head in her driver’s license photo. Lindsay Miller claims the spaghetti strainer is a sign of her devotion to the Church of the Flying Spaghetti Monster. “I’m not a Pastafarian. But my understanding, and my view of it, is that it’s a secular religion that uses parody to make certain points about a belief system,” DeJuneas said. The Church of the Flying Spaghetti Monster, according to its website, first “came into the mainstream” in 2005. The international movement, which has its own gospel, says it’s not making an anti-religious statement by advancing a set of outlandish beliefs. The group, which subscribes to the idea that an invisible creature made from cooked noodles could be responsible for gravity, sells itself as all-inclusive, which attracted Miller in the first place. The church says it highlights the need to make a distinction between the beliefs espoused by various religions and the value that people get from them. “The fact that millions of people get something positive out of a religion — even if it is based in superstition — does mean something. But that’s not to say it’s True, only that it has Value,” said the church’s website, which veers from the silly to the serious. Miller had spent two months without a license when the RMV suddenly canceled her appeal hearing in October. A second hearing was slated for this week, but officials from the Registry instead contacted DeJuneas on Tuesday, and agreed to allow Miller to wear the colander in her license photo. “The RMV processed the customer’s request consistent with its established facial image policy,” Michael Verseckes, a spokesman for the Massachusetts Department of Transportation, said in an e-mailed statement. Verseckes said he didn’t know if Miller was the first person in the state to wear a colander in a license photo. “The RMV does not track instances in which we accommodate religious beliefs asserted when license images are captured,” he said. Pastafarians in other states, including Utah and Missouri, have donned colanders in license photos to honor the noodle deity. In 2014, a Pomfret, N.Y., town councilor wore a strainer on his head when he took his oath for office. Miller said she was delighted by the state’s decision to allow her to exercise her religious freedom. “I haven’t had an ID for quite a few months, and that’s kind of been a problem on certain things, so I’m glad I don’t have to wait any longer,” Miller said. On Thursday, she went with her boyfriend to pick up a temporary license, and take a new photo while wearing the spaghetti strainer.